Jet Magazine Unveils New Look, But Will It Matter? *Black magazine icon, Jet, is going through some changes. Johnson Publishing, the company behind the weekly is announcing some big moves for the mag. 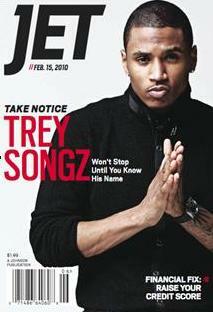 Beginning Monday, with its Feb 15 edition, featuring singer Trey Songz on the cover, Jet will unveil its new look, including a new logo, new design and layout, new sections and features. The brand will showcase various points-of-view from recognizable contributors such as Dr. Ian Smith, Warren Ballentine and Fonzworth Bentley. Additionally, Jet will maintain reader favorites such as Jet Beauty and Jet Love (formally known as Love and Happiness), while also covering sports, finance, beauty and style. Hopefully the changes will help because it’s no secret that both Jet and Johnson’s other iconic property, Ebony, have been slipping as far as subscriber/readers and revenue. Next ArticleTiger Woods Returning to Golf in Two Weeks? New Media didn’t kill ebony magazine…bad management did! THANK YOU for this post. The Internet is only half the truth!